Radiall’s SMPM* snap-on connectors have a relatively small interface, making it difficult to achieve secure centre contact captivation, with sufficient retention force, when traditional PTFE machined insulators are used. In use poor connectivity reduces the reliability of the systems in which these connectors are used – the connectors are used in rugged environments, and they are typically used in military applications, such as airborne radars or active antenna systems. SMPM is also a popular connector interface in telecommunications, where it is used to drive or modulate optical signals at a very high bit rate in optoelectronic modules. Radiall’s solution was to mould a new ultra-miniature insulator with VICTREX® PEEK polymer, and this has been implemented on most SMPM cable and receptacle connectors. This innovative insulator is less than 2.0mm in diameter, and its shape has been optimised using advanced simulation software, to provide excellent RF performance at up to 65GHz. The possibility of achieving centre contact captivation that has secure retention is now much higher than with traditional machined PTFE insulators. An additional benefit is that SMPM connectors using the PEEK based insulator are less subject to mechanical stress and overheating during soldering and assembly. 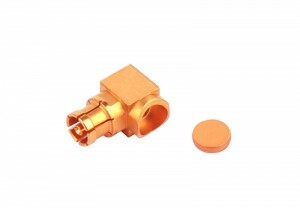 The main advantages of SMPM connectors are their small size and high operating frequency, as compared with similar push-on or blind-mate connector series. Radiall’s SMPM connectors meet and exceed the MIL-STD-348 standard. They are rated for an impedance of 50 ohms and operate in a frequency range of 0-65GHz. The connector body is of beryllium copper (CuBe2) or stainless steel, and the series is available with a smooth bore or full detent interface. VICTREX PEEK is a thermoplastic polymer which combines outstanding mechanical properties and chemical resistance that are retained to high temperature. Because of its robustness, Victrex PEEK polymer can be used to manufacture items for the use in demanding applications. And its ease of processing by conventional injection moulding process makes freedom of design and cost efficiency compatible. *SMPM are connector system similar to the SMP- or SMP-com series. They are snap-on or push-on types with a coaxial configuration. The difference between SMPM and SMP is, the SMPM one is more compact (about 30% smaller), offering a stable performance up to frequencies of 65GHz opposed to 40GHz of the SMP type coax connectors. For more information, please visit the Victrex website at www.victrex.com.